Within the kidney, the (pro)renin receptor (PRR) is predominantly expressed in the collecting duct (CD), particularly in intercalated cells, and it is regulated by the PGE2 receptor EP4. Notably, EP4 also controls urinary concentration through regulation of aquaporin 2 (AQP2). Here, we tested the hypothesis that sequential activation of EP4 and PRR determines AQP2 expression in the CD, thus mediating the antidiuretic action of vasopressin (AVP). 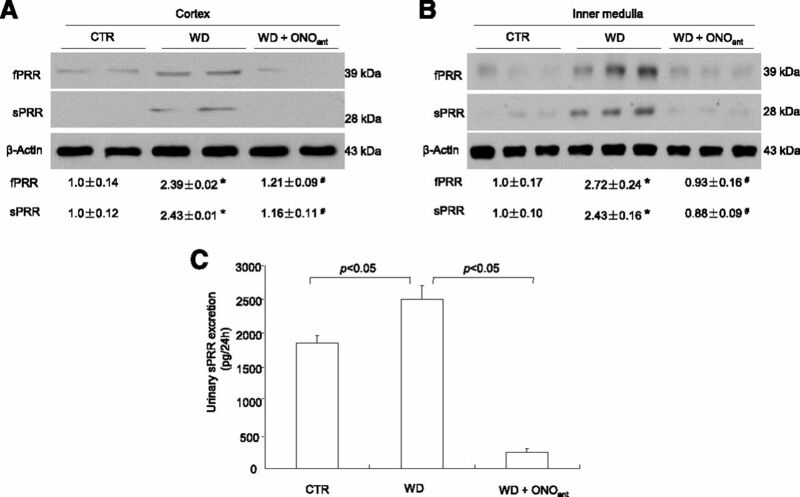 Water deprivation (WD) elevated renal PRR expression and urinary soluble PRR excretion in rats. Intrarenal infusion of a PRR decoy peptide, PRO20, or an EP4 antagonist partially prevented the decrease in urine volume and the increase in urine osmolality and AQP2 expression induced by 48-hour WD. In primary cultures of rat inner medullary CD cells, AQP2 expression induced by AVP treatment for 24 hours depended on sequential activation of the EP4 receptor and PRR. Additionally, mice lacking PRR in the CD exhibited increased urine volume and decreased urine osmolality under basal conditions and impaired urine concentrating capability accompanied by severe volume loss and a dangerous level of plasma hyperosmolality after WD. Together, these results suggest a previously undescribed linear AVP/PGE2/EP4/PRR pathway in the CD for regulation of AQP2 expression and urine concentrating capability. It is well established that, in the collecting duct (CD), action of vasopressin (AVP) via V2R activates the cAMP/PKA pathway that directs aquaporin 2 (AQP2) to the apical membrane, leading to increased water permeability.1 Although the dominant role of AVP in urine concentrating capability is well recognized, other factors are likely involved. A nonbiased approach has identified the PG EP4 receptor as the highly expressed GPCR in addition to the V2R.2 In microdissected nephron segments, EP4 mRNA was abundantly detected in the cortical CD,3 where PGE2 stimulated cAMP production.4 Administration of an EP4 agonist ONO-AE1–329 to a mouse model of nephrogenic diabetes insipidus (NDI) improved all disease manifestations.2 In addition, the renin-angiotensin system (RAS) is also involved in regulation of urine concentrating capability.5 Currently, an integrative understanding of the role of multiple pathways in the urine concentrating mechanism is lacking. On the basis of the above information as well as the recent evidence supporting COX-2 and EP4 as important regulators of renal medullary PRR expression,12,13 we hypothesized that CD PRR may play an important role in determining urine concentrating capability by interacting with AVP and the EP4 receptor. We evaluated the functional role of renal medullary PRR by using a PRR decoy inhibitor PRO2014 and generating CD–specific PRR deletion. In addition, we performed in vitro and in vivo studies to define the relationships between AVP, the EP4 receptor, and PRR. Our previous study suggests PRR as a molecular target of the EP4 receptor,13 a known regulator of urine concentration.2 Here, we attempted to examine whether renal PRR expression was stimulated by water deprivation (WD) and if so, whether the EP4 receptor was involved. By immunoblotting, the full-length PRR, detected as a 39-kD band, was significantly elevated in both the renal cortex and the inner medulla after WD, and this elevation was completely abolished by an EP4 antagonist ONO-AE3–208 (ONOant) treatment (Figure 1, A and B). PRR is cleaved by furin15 or ADAM1916 to produce a 28-kD soluble (pro)renin receptor (sPRR). Immunoblotting showed that sPRR abundance in the two kidney regions exhibited a similar pattern of changes as full-length PRR (Figure 1, A and B). Using ELISA, we observed a significantly increased urinary sPRR excretion after WD, which was suppressed by ONOant treatment (Figure 1C). 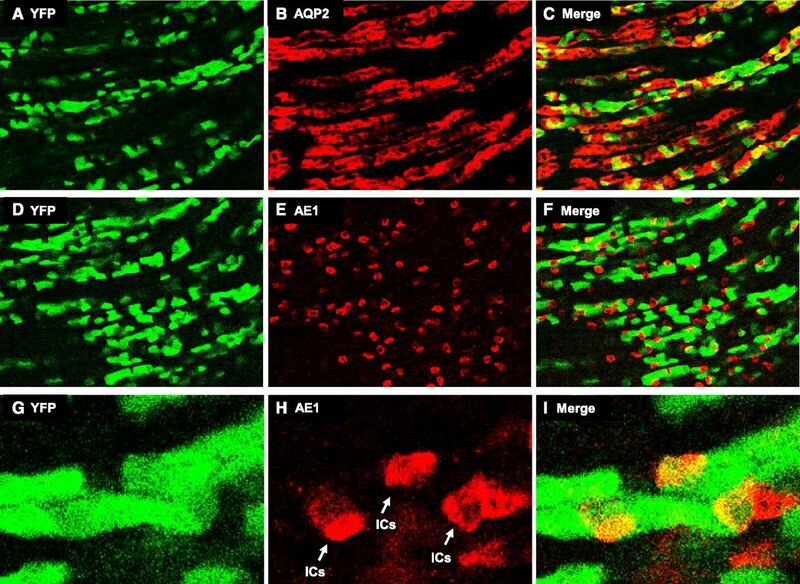 By immunostaining using an anti-PRR antibody raised against the C terminus of PRR (termed anti–PRR-C antibody; Abcam, Inc., Cambridge, MA), the increased PRR expression occurred mostly in AQP2-negative cells of the CD in both the cortex (Supplemental Figure 1) and the outer medulla (Supplemental Figure 2), suggesting the labeling in intercalated cells. Regulation of renal PRR expression during antidiuresis with or without treatment with an EP4 antagonist. Sprague–Dawley rats were administered with vehicle or an EP4 antagonist ONOant via diet for 7 days and then water deprived for 48 hours or had free access to water. (A and B) Immunoblotting analyses of full–length (pro)renin receptor (fPRR) and sPRR were done in the renal cortex and the inner medulla (n=8 rats per group). The variation in the band pattern of the 43-kD band was because of differences in the duration of electrophoresis, with a longer electrophoresis in B than that in A. Densitometric values are shown underneath the blots. *P<0.05 versus control; #P<0.05 versus WD alone. (C) ELISA detection of urinary sPRR (n=4 rats per group). Data are means±SEMs. CTR, control. We examined the functional role of PRR in urine concentration by using a specific PRR decoy inhibitor PRO20.14 The WD induced a decrease in urine volume and an increase in urine osmolality in vehicle-treated rats, and the changes of these two parameters were both partially blunted by intramedullary infusion of PRO20 (Figure 2, A and B). By immunoblotting, renal AQP2 was detected as a 28-kD band (nonglycosylated) and 35- to 45-kD bands (glycosylated). AQP2 protein abundance in both the cortex and the inner medulla was elevated after WD in the vehicle group, and this increase was less in PRO20-treated animals (Figure 2, C and D). Urinary AVP was increased approximately 10.0-fold after WD, which was unaffected by PRO20 treatment (Figure 2E). Effect of PRO20 on urine concentrating capability in rats. PRO20 or vehicle was administered to Sprague–Dawley rats via a catheter chronically implanted in the kidney for 7 days followed by WD for 48 hours. The second 24-hour urine was analyzed. (A) Urine volume after WD (n=8 rats per group). (B) Urine osmolality after WD (n=8 rats per group). (C and D) Immunoblotting analysis of AQP2 was done in the cortex and inner medulla (n=8 rats per group). *P<0.05 versus control; #P<0.05 versus WD alone. (E) ELISA measurement of urinary AVP (n=6 rats per group). Data are means±SEMs. CTR, control. The antidiuretic action of the EP4 receptor was discovered on the basis of the use of an EP4 agonist.2 However, the function of endogenously activated EP4 receptors during antidiuresis is less clear. ONOant treatment elevated urine volume and reduced urine osmolality during antidiuresis, indicating impairment of urine concentrating capability (Figure 3, A and B). 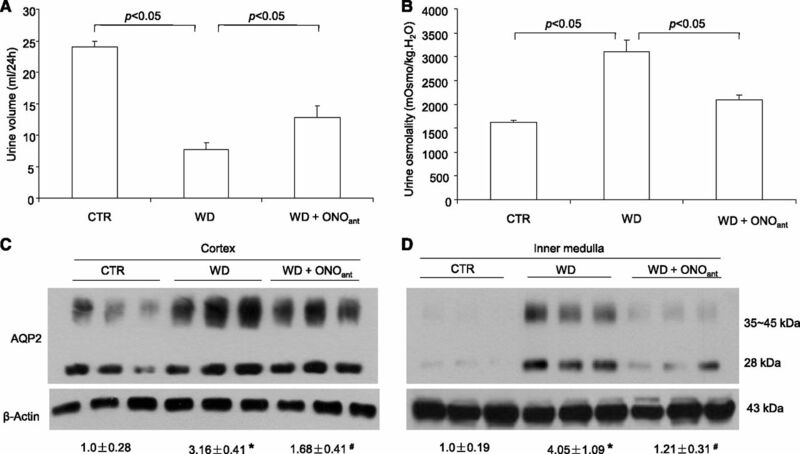 In parallel, this treatment effectively suppressed WD-induced upregulation of AQP2 expression in both the renal cortex and the inner medulla (Figure 3, C and D). By renin activity assay, WD induced parallel increases in prorenin levels in plasma, urine, renal cortex, and inner medulla, all of which were significantly blunted by ONOant treatment (Supplemental Figure 3, A–D); renin activity followed the same pattern of changes as prorenin, except that plasma renin activity was unaffected by WD (Supplemental Figure 3, E–H). Similar results were obtained with ELISA measurement of prorenin/renin (Supplemental Figure 4, A–D) and quantitative RT–PCR detection of renal renin mRNA (Supplemental Figure 4, E and F). Given no evidence for PRR regulation of renin expression, we speculate that the EP4 receptor may independently target PRR and prorenin/renin to activate intrarenal RAS during antidiuresis. Effect of EP4 antagonism on urine concentrating capability in rats. Sprague–Dawley rats were pretreated with vehicle or ONOant for 7 days and water deprived for 48 hours with or without ONOant treatment or had free access to water. ONOant was mixed in chow diet at 0.2 mg/kg per day. (A) Urine volume during 48 hours of WD (n=8 rats per group). (B) Urine osmolality during 48 hours of WD (n=8 rats per group). (C) Immunoblotting analysis of AQP2 in the cortex (n=6 rats per group). (D) Immunoblotting analysis of AQP2 in the inner medulla (n=6 rats per group). Data are means±SEMs. CTR, control. *P<0.05 versus control; #P<0.05 versus WD alone. We examined the effect of prorenin/renin on AQP2 protein expression in primary rat IMCD cells grown in Transwells (VWR International, West Chester, PA). Treatment with prorenin at 10 nM for 24 hours induced an increase in AQP2 protein expression (Figure 4, A–C). In contrast, renin treatment at the same dose and the same time period was without an effect (data not shown). To assess the involvement of PRR in prorenin–induced AQP2 protein expression, PRR antagonism was achieved with three independent approaches, including PRO20, anti–PRR-N antibody,17 and PRR siRNA. A quite consistent blockade of prorenin–induced AQP2 upregulation was observed with each of these approaches, despite some variable efficacies. Of note, these results, for the first time, suggested that anti–PRR-N antibody may act as a neutralizing antibody, possibly by binding to sPRR. 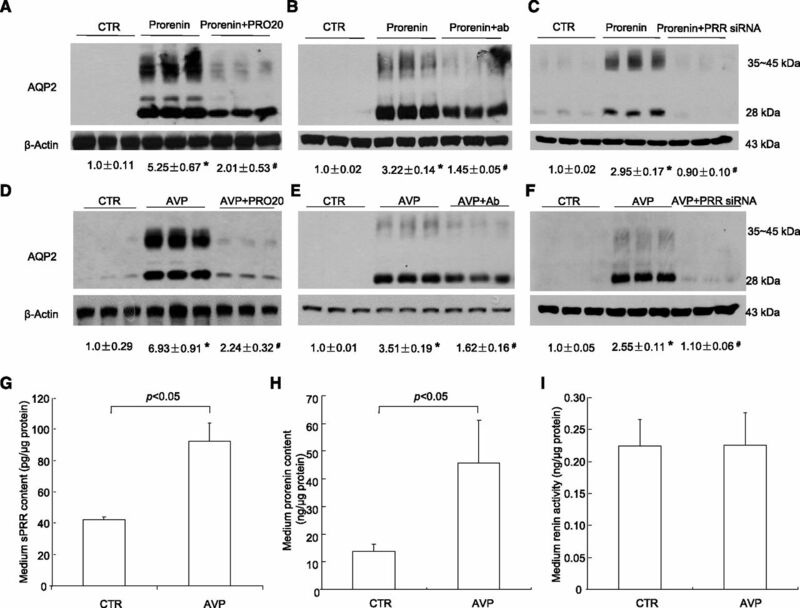 The direct role of prorenin/PRR in regulation of AQP2 expression in AVP signaling in the CD cells. Primary rat IMCD cells were pretreated with PRO20 or anti–PRR-N antibody or pretransfected with PRR siRNA and then treated for 24 hours with 10 nM prorenin. AQP2 protein expression was determined by immunoblotting and normalized by β-actin. (A) Effect of prorenin alone or in combination with PRO20 on AQP2 expression (n=6 per group). (B) Effect of prorenin alone or in combination with anti–PRR-N antibody on AQP2 expression (n=6 per group). (C) Effect of prorenin alone or in combination with PRR knockdown on AQP2 expression (n=6 per group). To test the role of PRR in regulating AQP2 expression induced by AVP in the CD cells, primary rat IMCD cells were pretreated with PRO20 or anti–PRR-N antibody or pretransfected with PRR siRNA or scrambled siRNA and then treated for 24 hours with 10 nM AVP. AQP2 protein expression was determined by immunoblotting and normalized by β-actin. The medium was assayed for sPRR, prorenin, and renin activity and normalized by protein content. (D) Effect of AVP with or without PRO20 on AQP2 expression. (E) Effect of anti–PRR-N antibody on AVP–induced AQP2 expression. (F) Effect of PRR knockdown on AVP–induced AQP2 expression. (G) ELISA analysis of medium sPRR (n=3 per group). (H) Medium prorenin content (n=3 per group). (I) Medium renin activity (n=3 per group). Data are means±SEMs. CTR, control. *P<0.05 versus control; #P<0.05 versus prorenin or AVP alone. AVP is well known to upregulate AQP2 expression mostly because of its cAMP mobilizing capability.1 We questioned whether PRR served as a mediator in AVP regulation of AQP2 expression. In most CD cell lines grown in six-well plates, AVP hardly stimulates AQP2 expression. However, in primary rat IMCD cells grown in Transwells (VWR International), AVP treatment for 24 hours at 10 nM reproducibly induced AQP2 protein expression (Figure 4D). The AVP–induced AQP2 upregulation was blunted by PRO20 (Figure 4D), anti–PRR-N antibody (Figure 4E), and PRR siRNA (Figure 4F), suggesting involvement of PRR. Medium sPRR (Figure 4G) and prorenin concentration (Figure 4H) exhibited parallel increases in response to AVP; in contrast, medium renin activity was unaffected (Figure 4I). The antidiuretic actions of AVP and the EP4 receptor are well established, with both signaling through Gs-coupled receptors.1,18–20 However, the relationship between the two pathways is not well defined, although activation of the EP4 receptors is considered to serve as a backup mechanism when AVP pathway is impaired.21,22 Early evidence suggests a stimulatory effect of AVP on PGE2 release from renal medullary cells.23 Consistent with this observation, we found that 10 nM AVP treatment for 24 hours induced PGE2 release in the medium (Figure 5A). ONOant effectively blocked AVP–induced AQP2 protein expression (Figure 5B). Conversely, EP4 agonism with an EP4 agonist CAY10580 (CAY) induced a marked increase in AQP2 protein (Figure 5, C and D). The CAY-induced upregulation of AQP2 was similarly blunted by both PRO20 and anti–PRR-N antibody. The role of PGE2/EP4 in AVP upregulation of AQP2 expression in the CD cells. Primary rat IMCD cells were pretreated with an EP4 antagonist ONOant and then treated for 24 hours with 10 nM AVP. AQP2 protein expression was determined by immunoblotting and normalized by β-actin. The medium was subjected to ELISA analysis of PGE2. In a separate experiment, the cells were pretreated with PRO20 or anti–PRR-N antibody and then treated for 24 hours with an EP4 agonist CAY. AQP2 expression was determined by immunoblotting. (A) Medium PGE2 after treatment with vehicle or AVP (n=9 per group). (B) Effect of AVP with or without ONOant on AQP2 expression. (C) Effect of CAY with or without PRO20 on AQP2 expression. 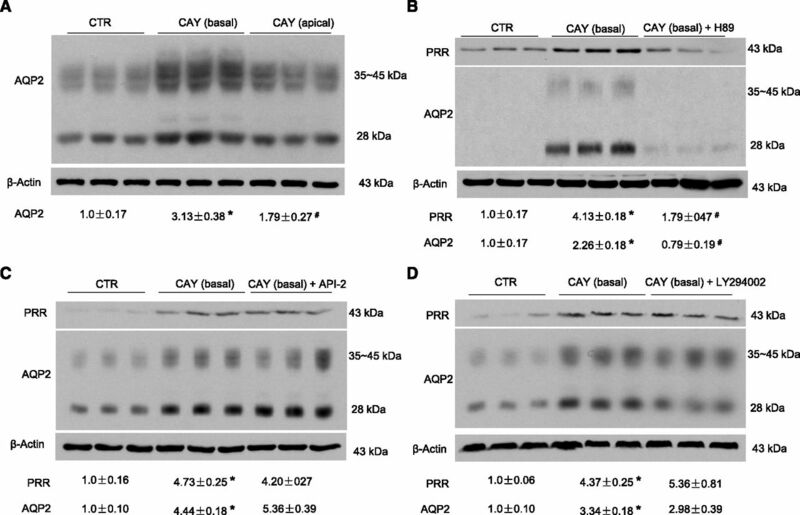 (D) Effect of CAY with or without anti–PRR-N antibody on AQP2 expression. The representative blots in B–D were from two or three independent experiments. Densitometry analysis was only performed on the representative blots (n=3 per group). Data are means±SEMs. CTR, control. *P<0.05 versus control; #P<0.05 versus AVP or CAY alone. The EP4 receptor can act on both basolateral and apical sides of renal epithelial cells and signal through cAMP/PKA, PI3K, and PKB pathways.24,25 We found that addition of CAY to the basal but not the apical side simulated AQP2 expression (Figure 6A). The induction of AQP2 expression by basal EP4 activation was nearly completely blocked by a PKA inhibitor H89 (Figure 6B) but largely unaffected or only modestly affected by a PI3K inhibitor LY294002 or a PKB inhibitor API-2 (Figure 6, C and D). These results have substantiated the role of the cAMP/PKA pathway in EP4 upregulation of PRR expression. The role of the cAMP/PKA pathway in EP4 upregulation of AQP2 expression in the CD cells. Primary rat IMCD cells grown in Transwells (VWR International) were pretreated with PKA inhibitor (H89), PKB inhibitor (API-2), or PI3K inhibitor (LY294002) and then treated for 24 hours with 10 μM EP4 agonist (CAY). AQP2 protein expression was determined by immunoblotting and normalized by β-actin. (A) Comparison of the effect of CAY administered from basal and apical sides. This experiment showed that basal but not apical administration of CAY stimulated AQP2 expression. Therefore, in the subsequent experiments (B–D), CAY was added to the basal side, and the inhibitors were added to both sides. (B) Effect of CAY with or without H89 on AQP2 expression. (C) Effect of CAY with or without API-2 on AQP2 expression. (D) Effect of CAY with or without LY294002 on AQP2 expression (n=6 per group). Data are means±SEMs. CTR, control. *P<0.05 versus control; #P<0.05 versus CAY alone. Male PRR floxed mice were crossed with female AQP2-Cre transgenic mice to produce conditional disruption of the PRR gene in the CD (termed CD PRR knockout [KO] mice). It has been reported that 125 kb of the 5′ upstream region of the AQP2 gene drive Cre–mediated gene targeting in both principal and intercalated cells.26 In this study, a different AQP2-Cre transgene containing 14 kb of the 5′ flanking region of the AQP2 gene was used.27 We found that mice harboring AQP2-Cre and ROSA26-YFP exhibited YFP expression in anion exchange 1 (AE1) –positive cells (marker of α-intercalated cells) in addition to AQP2-postive cells (Figure 7). PCR on microdissected nephron segments confirmed that DNA recombination in the null mice was restricted to the CD (Supplemental Figure 5A). 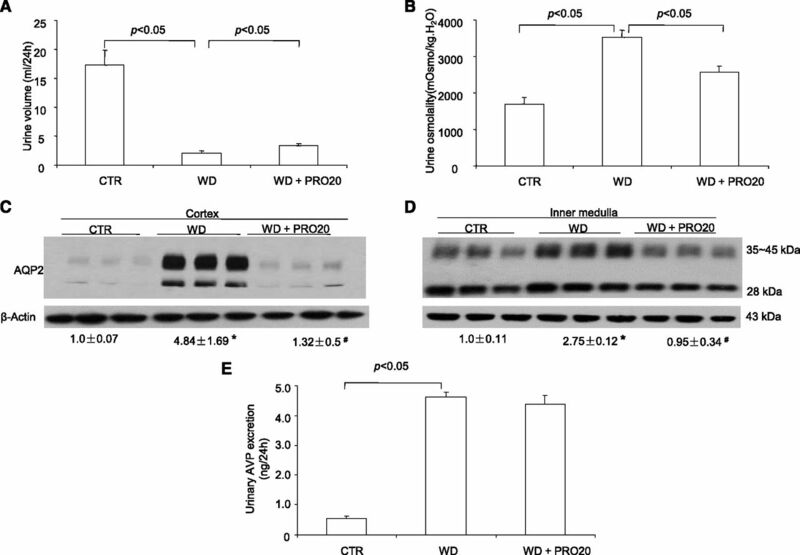 Immunoblotting analysis revealed a significant reduction of PRR protein expression in the renal medulla of the null mice (Supplemental Figure 5B). Immunofluorescence using anti–PRR-C antibody showed the labeling in renal medullary intercalated cells in the floxed mice, which was quite remarkably reduced in the null mice (Figure 8, A–D). 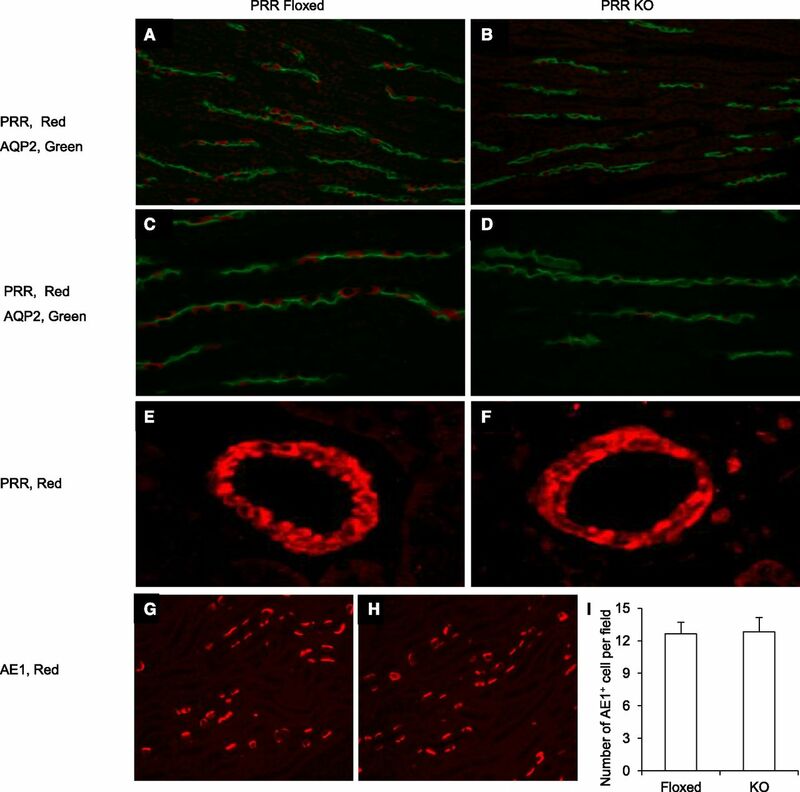 In contrast, PRR labeling in the vascular smooth muscle cells was unaffected (Figure 8, E and F). The number of AE1-positive cells was also similar between the two genotypes (Figure 8, G–I), suggesting that CD PRR deletion did not affect intercalated cell differentiation. Validation of AQP2-Cre activity in intercalated cells. A–C show colocalization of YFP and AQP2 in mice doubly heterozygous for ROSA26-YFP and AQP2-Cre. D–F show colocalization of YFP and AE1 at low magnification. G–I show colocalization of YFP and AE1 at high magnification. Shown are representative photomicrographs from at least three animals per group. All images were derived from immunofluorescence of the renal medulla. IC, intercalated cell. Immunofluorescence validation of PRR deletion in intercalated cells of CD PRR KO mice. (A–D) The kidney sections of CD PRR KO and floxed mice were colabeled for PRR (red) and AQP2 (green) in the renal medulla. Original magnification, ×400. E and F show PRR labeling in the renal blood vessels. G and H show colabeling of AQP2 and AE1. (I) Shows the number of AE1-positive cells per field counted from 16 fields per group. All images were derived from immunofluorescence of the renal medulla. At basal condition, CD PRR KO mice already exhibited polydipsia (Figure 9A) and polyuria (Figure 9B) accompanied with hypo-osmotic urine (Figure 9C) compared with their floxed controls. After 24-hour WD, urine volume was higher and urine osmolality was also lower in the null mice than in the floxed controls (Figure 9, B and C). However, a two-way ANOVA detected no interaction (strain/treatment) for either one of these parameters, suggesting that the response of urine volume and osmolality to WD was not affected by absence of CD PRR. It is possible that PRR may primarily affect the basal water permeability. Likely as a result of fluid loss, the dehydrated null mice displayed significantly increased hematocrit (Figure 9D) and plasma osmolality (Figure 9E), with the latter reaching a dangerous level (KO/WD: 380.0±5.9 versus Flox/WD: 346.0±5.7 mOsm/kg∙water; P<0.01). Phenotype analysis during antidiuresis in CD PRR KO mice. (A) Water intake under basal conditions (n=8 mice per group). (B) Urine output before and after WD (n=8 mice per group). (C) Urine osmolality before and after WD (n=8 mice per group). (D) Hematocrit (Hct) in dehydrated null and floxed controls (n=5 mice per group). (E) Plasma osmolality in dehydrated null mice and floxed controls (n=5 mice per group). Data are means±SEMs. CD PRR KO mice had reduced abundance of AQP2 protein in the renal medulla under basal conditions (Figure 10A). After 24-hour WD, urinary renin activity was significantly increased in floxed mice, and this increase was completely abolished by CD PRR deletion (Figure 10B). This result suggests that WD–induced renin activity is under the control of CD PRR. This notion is compatible with the concept that PRR is a regulator of renin activity. Urinary AVP excretion was similarly increased in floxed mice after 24-hour WD, whereas this increase was unaffected in the null mice (Figure 10C). 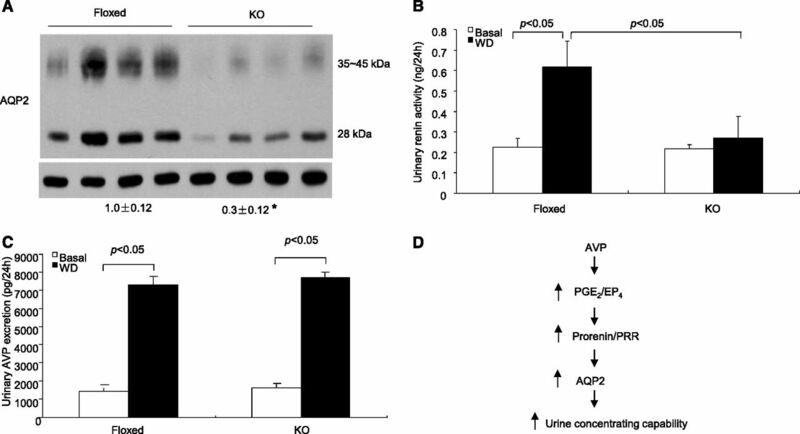 Analysis of renal AQP2 expression, urinary renin activity, and urinary AVP excretion in CD PRR KO mice. (A) Immunoblotting analysis of renal AQP2 expression in CD PRR KO and floxed mice under basal condition. AQP2 expression was determined by immunoblotting and normalized by β-actin. Densitometric values are shown underneath the blots. *P<0.05 versus floxed. (B) Urinary renin activity in the two genotypes under basal and WD conditions. (C) Urinary AVP excretion in the two genotypes under basal and WD conditions. Data are means±SEMs. (D) Illustration of the AVP/EP4/PRR pathway for regulation of AQP2 expression and urine concentrating capability. During WD, AVP alone or together with other factors stimulated PGE2 biosynthesis, activating the EP4 receptor, which mediates activation of local RAS and PRR, and leading to increased AQP2 expression and enhanced urine concentrating capability. However, the mechanism whereby activation of PRR in intercalated cells increases AQP2 expression in principal cells is not clear at present. PRO20 is a newly developed, highly specific PRR decoy inhibitor that interrupts the binding of prorenin to PRR.14 Rats infused with PRO20 had high urine volume and lower urine osmolality than the vehicle control after 48-hour WD, suggesting impaired urine concentrating capability. PRO20 treatment significantly suppressed the WD-induced increase of renal AQP2 expression, consistent with the concept that PRR may primarily target AQP2 to enhance urine concentration. To more definitively study the role of CD PRR, we generated conditional deletion of PRR in the CD using AQP2-Cre mice. Although the AQP2-Cre was originally thought to target CD principal cells,30–32 recent evidence shows that, during kidney development, AQP2 is expressed in a cell lineage that gives rise to both principal and intercalated cells, and therefore, the AQP2-Cre will target both cell types.33 The AQP2-Cre transgene used in the previous study harbors 125 kb of the 5′ upstream region of the AQP2 gene.26 In this study, a different AQP2-Cre transgene containing 14 kb of the 5′ flanking region of the AQP2 gene was used27 to inactivate PRR in the CD. Indeed, we found that mice harboring AQP2-Cre and ROSA26-YFP exhibited YFP expression in AE1-positive cells in addition to AQP2-postive cells. At basal condition, CD PRR KO mice already exhibited symptoms of NDI. These results show a nonredundant role of CD PRR in determining urine concentrating capability. A landmark study has established the pharmacologic significance of the EP4 receptor as a novel therapeutic target for treatment of NDI.2 Subsequently, it has been shown that activation of the EP4 receptor in cultured MDCK cells induces apical membrane accumulation of AQP2.21 However, the detailed mechanism responsible for EP4 regulation of AQP2 is not known, and also, the physiologic function of this receptor subtype is not known. Our previous studies showed that renal medullary COX-2 is highly induced during antidiuresis and has been characterized as an osmotic responsive gene.34–36 It is conceivable that COX-2–derived PGE2 may signal via the EP4 receptor to participate in regulation of water balance during antidiuresis. In this study, we used an EP4 antagonist to prove an active role of the endogenous activation of the PGE2/EP4 pathway in the control of water balance during antidiuresis. Although both basolateral and apical actions of the EP4 receptor have been described,24 the upregulation of AQP2 expression in our model seems to be preliminarily caused by activation of the basolateral but not the apical EP4 receptor. More importantly, we have identified PRR as a key mediator of EP4 regulation of AQP2 expression. Not only did the EP4 receptor target PRR, but it also determines prorenin/renin levels, thus making it an efficient regulator of the prorenin/PRR system. Furthermore, we provided evidence supporting an essential role of cAMP/PKA but not Akt/PKB or PI3 kinase in mediating the EP4 signaling to induce PRR expression, although involvement of all of these three pathways is reported.25,37 Our findings are in agreement with a large number of studies showing that deletion of phospholipase-A238 and COX-239 or administration of indomethacin40 decreases urine concentrating ability or renal AQP2 expression, although inhibition of PG synthesis can be associated with a low incidence of edema in high-risk patients.41 Of note, our study is limited in that we were unable to show the EP4 receptor expression in intercalated cells because of the lack of a reliable antibody against it. AVP signaling via Gs-coupled V2R represents the dominant mechanism in regulation of urinary water excretion. The Gs–coupled EP4 receptor is highly expressed in the CD and exerts a similar antidiuretic action.2 The PGE2/EP4 pathway is only considered as a backup mechanism that may become important when the AVP/V2R pathway is impaired.1,18–20 However, we showed that the PGE2/EP4 pathway actively participated in the control of the AQP2 level and urine concentrating capability when AVP signaling is intact. Moreover, we discovered that AVP and the EP4 receptor share the common mediator, PRR, to upregulate AQP2 expression. The findings that AVP stimulated PGE2 release and that EP4 inhibition effectively blocked AVP–induced AQP2 upregulation suggest a sequential rather than a parallel relationship between the EP4 receptor and AVP. PRR is shown to be colocalized to the paraventricular and supraoptic nuclei of human hypothalamic with AVP42 and functionally regulate central AVP production.17,43,44 As expected, AVP level was unaffected by intrarenal PRR inhibition or CD PRR deficiency. In conclusion, this study used pharmacologic and genetic approaches to examine the regulation and function of CD PRR and its relationship with the EP4 receptor and AVP. We showed that PRR acts downstream of the EP4 receptor, regulating AQP2 expression and thus, mediating the antidiuretic action of AVP (Figure 10D). We, for the first time, defined a sequential AVP/EP4/PRR pathway in the distal nephron for regulation of AQP2 expression and urine concentrating capability. Male 10- to 12-week-old Sprague–Dawley rats were purchased from Charles River Laboratories (Wilmington, MA). All animals were cage housed and maintained in a temperature-controlled room with a 12-hour/12-hour light-dark cycle and free access to tap water and standard rat chow. Animals were randomized into different experimental groups. Animal protocols were approved by the Animal Care and Use Committee at the University of Utah. Under isoflurane inhalation, uninephrectomy was performed, and after 1 week of recovery, a second surgery was performed to place an infusion in the kidney. In the second surgery, the kidney was exposed from the flank region, and a catheter was placed approximately 3.0 mm underneath the surface and secured by using vet-bond glue; the other end of the catheter was connected to an osmotic minipump–delivering vehicle or PRO20 at 120 μg/kg per day. In a separate experiment, rats were given an EP4 antagonist ONOant at 0.2 mg/kg per day p.o. ; rats treated with the same diet without the drug served as controls. All animals were acclimatized to metabolic cages for 7 days. After collections of baseline data for 2 days, rats were water deprived for 48 hours and had free access to chow diets. At the end of the experiment, under isoflurane anesthesia, blood was withdrawn from the vena cava; one half of the kidney was cut into cortex and inner medulla, and the other one half was fixed and paraffin embedded. AQP2-Cre mice were bred with ROSA26-YFP mice (catalog no. 006148; The Jackson Laboratory, Bar Harbor, ME), and doubly heterozygous offspring were used for experiment. Kidneys were sectioned (30 μm), fixed, and immunostained with anti-AQP2 antibody (Santa Cruz Biotechnology, Santa Cruz, CA) or anti-AE1 antibody (Alphadiagnostic International, San Antonio, TX). Sections were then incubated with a secondary antibody and visualized by confocal microscopy. Mice with conditional deletion of PRR in the CD were generated as described in Supplemental Material. Male 12-week-old CD PRR KO mice and their littermate floxed controls were subjected to WD treatment, and sample collections were performed as described above for rats, except that mice were dehydrated for 24 hours. IMCD cells were prepared from 4-week-old Sprague–Dawley rats as previously described.13 The cells were grown in Transwells (catalog no. 29442–074; VWR International) with DMEM/F-12 medium containing 10% FBS, 0.5 μM 8-Br-cAMP, 130 mM NaCl, and 80 mM urea. After 4 days of growth, the cells were serum deprived for 12 hours and pretreated with an inhibitor (1.4 μM PRO20, 1.5 μg/ml anti–PRR-N antibody, 1 μM ONOant, 10 μM API-2, 10 μM LY294002, or 10 μM H89) followed by 24 hours of treatment with AVP (10 nM), prorenin (10 nM), renin (10 nM), or CAY (10 μM). At the end of the experiments, the medium was collected for biochemical assays, and the cells were harvested for immunoblotting. The primary cultures of rat IMCD cells were prepared as previously described. The cells were grown in Transwells (VWR International) at 50%–70% confluence; they were transfected with PRR siRNA (catalog no. SR513127; OriGene Technologies, Rockville, MD) or scrambled siRNA (catalog no. AM4636; Invitrogen, Grand Island, NY) using Lipofectamine RNAiMAX Transfection Reagent (catalog no. 13778–030; Invitrogen). After 72 hours of incubation, the cells were subjected to treatment with AVP or prorenin as described above. AVP, PGE2, prorenin/renin, and sPRR in biologic fluids were determined by using the following commercially available enzyme immunoassay kits according to the manufacturer’s instructions: the kits for PGE2 (catalog no. 514010; Cayman Chemicals, Ann Arbor, MI), AVP (catalog no. 583951; Cayman Chemicals), prorenin/renin (Molecular Innovations, Novi, MI), and sPRR (catalog no. JP27782; IBL, Toronto, ON, Canada). The tissues were fixed in 10% neutral buffered formalin for 24 hours and then, embedded in paraffin. After deparaffinization, thin sections (4 μm) were processed for double labeling with immunofluorescence. The slides were blocked in 1% BSA for 1 hour and then, coincubated with rabbit anti–PRR antibody (Abcam, Inc.), which was against residues 335–350 in the C terminus (termed anti–PRR-C antibody), goat anti–AQP2 antibody (Santa Cruz Biotechnology), or rabbit anti–AE1 antibody (Alphadiagnostic International) at 4°C for overnight. After washing off the primary antibody, sections were incubated for 1 hour at room temperature with donkey anti–goat IgG-FITC (Santa Cruz Biotechnology) and donkey anti–rabbit IgG-TRITC (Life Technologies, Grand Island, NY). To evaluate if there was a difference in the cell number of intercalated cells between the CD PRR KO and floxed mice, the number of intercalated cells was counted in sections stained with anti-AE1 antibody. Sixteen fields randomly selected from four animals per group were examined, and the mean cell number per field was presented. Renal tissues were lysed and subsequently sonicated. Protein concentrations were determined by using Coomassie reagent. Forty micrograms protein for each sample was denatured in boiling water, then separated by SDS-PAGE, and transferred onto nitrocellulose membranes. Blots were blocked for 1 hour with 5% nonfat dry milk in Tris-buffered saline followed by incubation overnight with goat anti–AQP2 antibody or anti-PRR antibody. After washing with Tris-buffered saline, blots were incubated with goat anti–rabbit/mouse horseradish peroxidase–conjugated secondary antibody and visualized using enhanced chemiluminescence. The blots were quantitated by using Imagepro-plus. Extraction of the membrane and cytosolic fractions of proteins was performed using a kit according to the manufacturer’s instructions (catalog no. BSP002; Bio Basic Inc.). Data are summarized as means±SEMs. All data points and animals were included in the statistical analyses. Sample sizes were determined on the basis of similar previous studies or pilot experiments, and no test of normality or power analysis was performed. Statistical analyses for animal and cell cultures experiments were performed by using ANOVA with the Bonferroni test for multiple comparisons or the paired or unpaired t test for two comparisons. P<0.05 was considered statistically significant. This work was supported by National Natural Science Foundation of China grants 91439205 and 31330037, National Basic Research Program of China 973 Program 2012CB517600 grant 2012CB517602, National Institutes of Health grants DK104072 and DK094956, and the Veterans Affairs Merit Review from the Department of Veterans Affairs. T.Y. is a Research Career Scientist in the Department of Veterans Affairs. F.W. and X.L. contributed equally to this work. See related editorial, “Prorenin Receptor, a Necessary Component in Urine Concentration Mechanism,” on pages 2919–2921. This article contains supplemental material online at http://jasn.asnjournals.org/lookup/suppl/doi:10.1681/ASN.2015050592/-/DCSupplemental.